A number of CPI-M offices came under attack. In several places in the suburbs of the state capital, it was a free for all as rival factions took on one another. In Nedumangadu near Thiruvananthapuram, crude bombs were thrown at CPI-M offices while homes of CPI-M leaders were attacked. Ten people in Kannur were arrested after they attacked vehicles that went past the BJP office. At Pandalam in Alappuzha district, BJP and RSS activists took out a protest march after one of their supporters who was injured in stone throwing by CPI-M workers on Wednesday died late at night. A CPI-M worker has been arrested and the wife of the deceased said the family does not believe a fair probe will happen. Thursday also saw widespread attacks on the media, leaving many journalists, including women, injured and shaken. 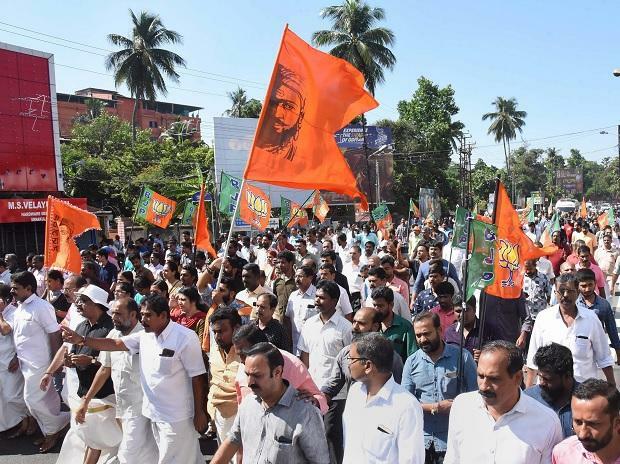 Ayyappa devotees stage protests in Karnataka Devotees of Lord Ayyappa staged protests at several places across Karnataka on Thursday against the entry of two women of menstruating age into the Sabarimala temple in neighbouring Kerala. (Read more here) Meeting under the banner of the 'Sabarimala Samrakshana Vedike' (Save Sabarimala Forum), the protesters demanded Kerala Chief Minister Pinarayi Vijayan's resignation over the incident. The protesters pointed out that Vijayan was not only a party leader but also the chief minister of a state and, hence, he should respect the religious sentiments of crores of Ayyappa devotees because India is a democratic country. Ayyappa devotees stage demonstrations in Hyderabad on Sabarimala issue Groups of devotees of Lord Ayyappa held demonstrations on Thursday in different parts of the city in protest against the entry of two women of menstruating age into the Sabarimala temple in Kerala. (Read more here) Holding placards that read "Save Sabarimala", the protesting devotees took out a rally in Saidabad area here and squatted on the road. They raised slogans against Kerala Chief Minister Pinarayi Vijayan and later also burnt his effigy. Kerala media boycotts BJP, Hindu group for attacks on journos With media personnel being attacked at various districts during the 12-hour hartal by saffron outfits against the entry of two women in their 40s into Sabarimala temple, the Kerala Union of Working Journalists on Thursday decided to boycott BJP and Sabarimala Karma Samithi. (Read more here) The press meets called by BJP state president P S Sreedharan Pillai and Samithi leader K P Sasikala were boycotted by the media this afternoon in protest against the widespread attacks faced by them since Wednesday afternoon. The government transport system has claimed a loss of around Rs 3.35 crore as the protesters attacked around 100 buses in two days. The annual loss due to the attacks in Hartals for the transport corporation is around Rs 10 crore, said officials. 745 people arrested Reports say that at least 745 people were arrested till Thursday evening, while 628 people were taken on custody as a precaution. Sabarimala panel says special police protection to women would affect rights of pilgrims A three-member panel appointed by the Kerala High Court to oversee the ongoing Sabarimala pilgrimage season has said granting special police protection to women in menstrual age to enter the Lord Ayyappa temple would adversely affect the rights and safety of other devotees. (Read more here) In a report submitted in the high court on Thursday, the committee referred to the incidents when police escorted 11 women activists of Manithi, a Chennai-based outfit, to Sabarimala on December 23 and two women on the next day and said this contributed to the long queue of pilgrims from the base camp at Pampa up to the place of hold up. The December 25 report also said because of the incidents, devotees, including women and children, had to wait for hours together for getting darshan.